I developed this little pattern a few years ago to solve a problem I had with carrying a few little things to and from the gym. In particular, it was my Ipod and earbuds that were constantly getting tangled. This little green bag is probably too pretty to be taking to the gym, but it can be used for other things too. 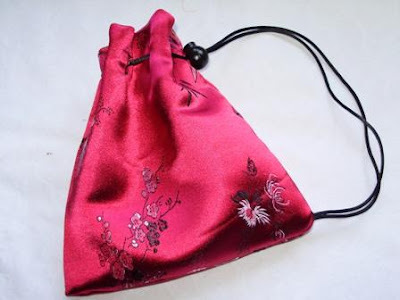 Perhaps a gift bag for something small and special. 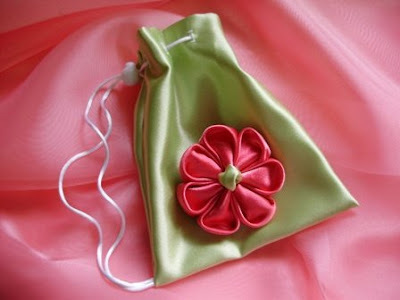 Embellish with embroidery or a folded flower like this one by Karencilla. This is my original bag that I made to go to the gym. I embroidered it with my true sentiment. I'd rather be quilting than at the gym. Beware, there are buttonholes in this project. But this is a perfect little project to practice them if you're not familiar with your machine. Project requirements for a bag that finishes just a little larger than 6" x 6". 1 piece fabric 8.5 " x 14"
If your fabric will fray easy, surge or zig zag around the 4 edges of your fabric. 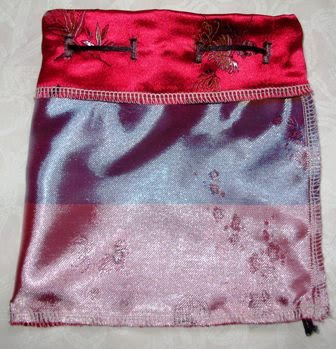 If you want to embroider on your bag, do it before you start the buttonholes. Along one of the long edges, fold over about 2 inches to the wrong side. Iron down lightly. This will be the top of your bag. You will need to make 8 small button holes approximately 3/4 inch down from the top, spaced out evenly along this long folded edge. Ensure that your first and last button hole are 2" inches in from the short side. The buttonhole only needs to be big enough to slip the cord through. 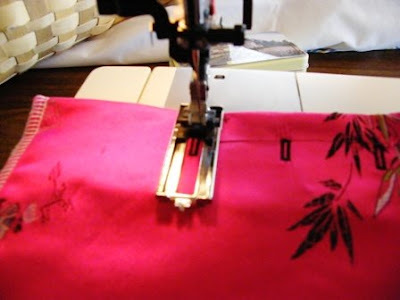 Open up the buttonholes with a sharp seam ripper. 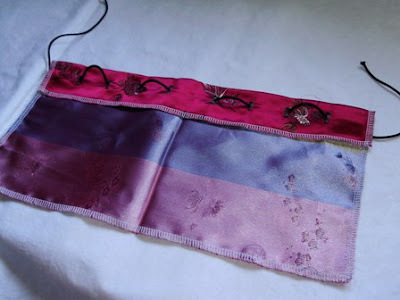 String the cording in and out of the buttonholes starting and ending on the right side of the fabric. 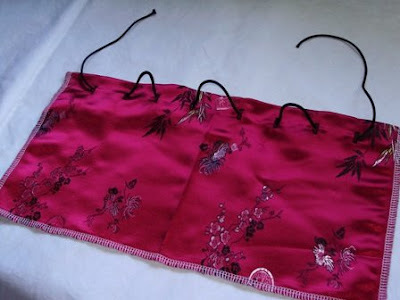 Now, fold the 2 short ends together, with right sides together, ensuring that the loose ends of the cord is not near the short sides of the fabric. With right sides together, pin the the short sides matching top and bottom. 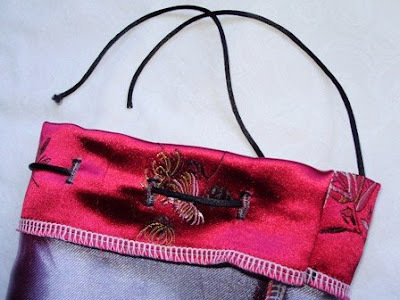 Bring the loose ends of the cord out of the inside top, so you don't stitch them in the side seam by mistake. Since there are button holes 2 inches in, you'll have to be careful and open up as best you can, and pin the seam. Stitch 1/4" along this short side. Move the seam to one side and fold down the top. The cord is still coming out the top. Now, slip on the spring closure. Don't miss this step, you will not be able to put the spring closure on after this point. 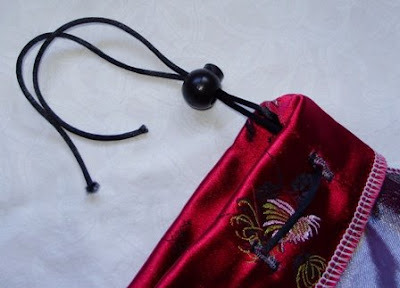 Move the 2 ends of the cord, inside, down to the bottom corner of the bag, near the seam you just finished. The ends will stick out a little bit. 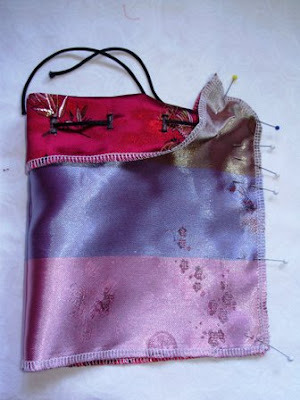 Pin in place so that the two ends of the cord are securely in the bottom corner of the bag. Stitch along the bottom of the bag. 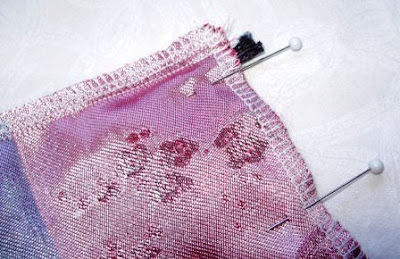 When you start your seam, take a few back and forth stitches over the cord to secure it in. This is the only place that the cords are sewn in. Finished. Turn the bag right side out. To close the bag, just slide the spring closure up the bag. 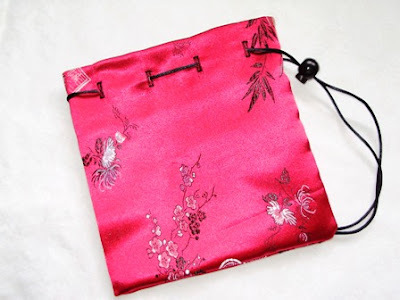 The ends of the cord are sewn into the bottom of the bag, so that you can hang this bag on the door or hook. It fits nice into the cup-holder of the treadmill or elliptical at the gym. 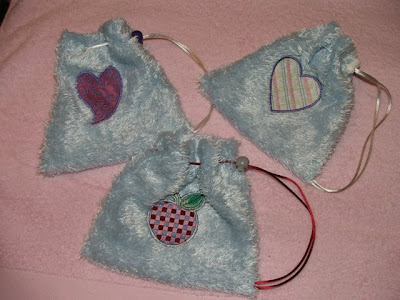 Here are three bags I made for some little girls to put their little treasures in. They were made out of soft fuzzy fabric and were embroidered with girly designs. thanks for stopping by at my blog! i love the bags! i am so glad that you liked my tutorial!. Aww, the pouches are just too lovely! The idea is so versatile, and the pouches came out really well. Were do you get the spring closure? I got the spring closure at my local fabric store, Fabricville. They come in a set of two, for less than a dollar. If you recycle, you might find one of these on an old fleece sweater that has a gathered bottom, or on a coat that has a gather at the waist. I have quite a collection of them. 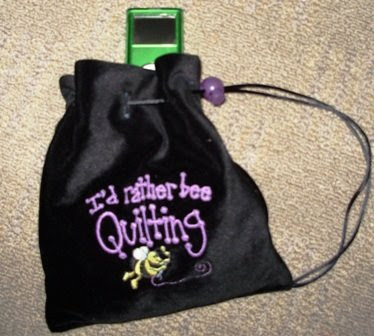 Love the Ipod bag. Just one question, how do you insert the cord in the spring closure?